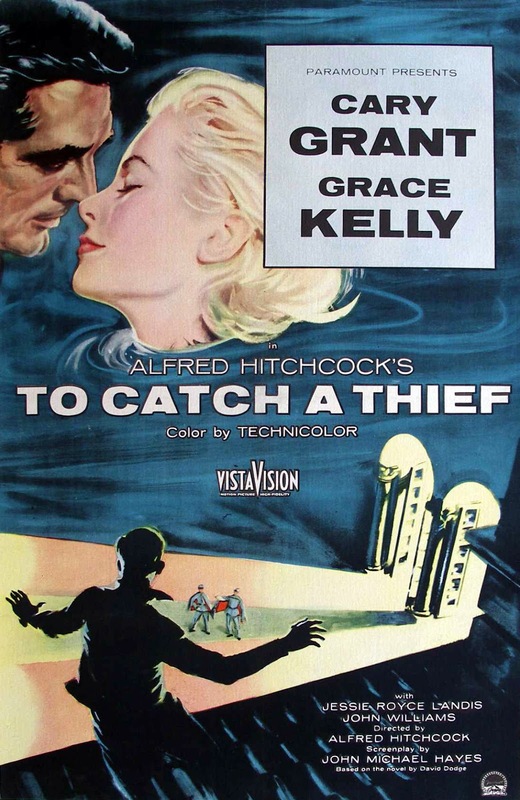 To Catch a Thief (1955), starring Cary Grant and Grace Kelly, is one of the 1001 classic movies you should see. Each Monday, I'm going to recommend a classic movie you should see (for the reasons behind the 1001 series and reviews of earlier films covered go here). October's selections will focus on felines in film. This week's movie is director Alfred Hitchcock's stylish thriller, To Catch a Thief (1955). To Catch a Thief tells the story of John Robie (Cary Grant), a suave former jewel thief known as "The Cat." Robie used to steal priceless jewels from fancy hotels on the Riviera, but once World War II started he turned away from a life of crime and joined the French Resistance. A new round of thefts has the rich and famous literally clutching their pearls, so a desperate Lloyds of London agent (John Williams) hires Robie to find the thief by checking in to a hotel under an assumed name. There Robie meets an American millionairess (Jessie Royce Landis) and her beautiful daughter (Grace Kelly). To Catch a Thief is based on David Dodge's 1952 novel (the title refers to the old adage "it takes a thief to catch a thief"). Hitchcock always had Kelly in mind for the female lead. but it took quite a bit of persuasion for the director to lure Grant out of his self-imposed retirement to play John Robie. The movie, which was filmed on location in the south of France, was a huge box-office success that revived Grant's career and made Kelly, who was already one of the most sought after actresses in Hollywood, a glamour icon. Much like Algiers (1938), To Catch a Thief is a film that influenced a lot of later, better known movies. While jewel heist movies were nothing new in Hollywood -- To Catch a Thief owes a huge debt to director Ernst Lubitsch's pre-code romp, Trouble in Paradise (1932) -- Hitchcock's breezy caper was hugely influential, especially on Blake Edwards Pink Panther movies. Also, Grant's suave portrayal of Robie, who looks great in a tuxedo while fighting crime, was a direct influence on the film portrayals of James Bond. 1. Location shooting. If you are in need of a virtual vacation to somewhere warm and sunny, then pop To Catch a Thief into your DVD player. Hitchcock and cinematographer Robert Burks provide a glorious VistaVision travelogue of the beaches, towns, and mountains of the French Riviera. The flower market scene, with its array of rich colors, is an especially beautiful treat. 2. Edith Head. When you're not ogling the gorgeous scenery, you can feast your eyes on designer Edith Head's gorgeous creations for Kelly, including an ice-blue evening dress and a gold-lame gown. 3. Brigitte Auber. The French actress, who plays the daughter of one of Robie's French Resistance comrades, steals every scene she's in with her thick Gallic accent and stylish pixie cut. 4 Fireworks scene. To Catch a Thief is filled with several brilliant set pieces, but none has been more widely imitated than the famous fireworks scene, which allowed the impish Hitchcock to run rings around the censors without showing anything indecent on screen. 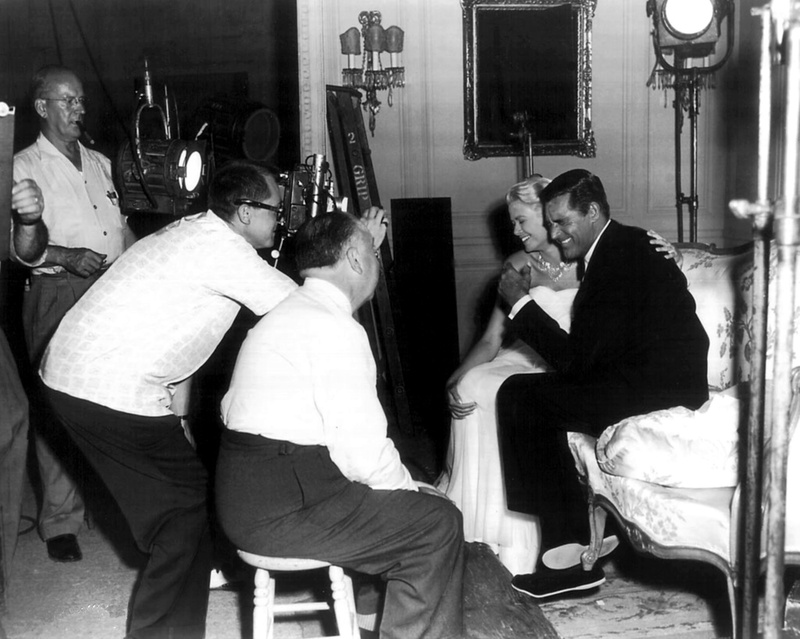 Director Alfred Hitchcock (seated with back to camera) shares a laugh with stars Grace Kelly and Cary Grant on the set of To Catch a Thief (1955). Other critics: To Catch a Thief has a 95 percent fresh rating at Rotten Tomatoes and Leonard Maltin writes that the movie is "chic and elegant in every way" in a three star review for his Classic Movie Guide. Critics in 1955 were generally favorable, although most, like Bosley Crowther of The New York Times, considered the movie fluffy entertainment. "To Catch a Thief does nothing but give out a good, exciting time. If you'll settle for that at a movie, you should give it your custom right now," Crowther opined. 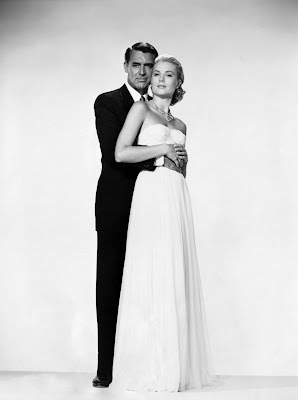 The bottom line: To Catch a Thief doesn't reach the Hitchcockian heights of Vertigo (1958) or Rebecca (1940), but it is still a fun, stylish entertainment with beautiful location scenery and even more beautiful movie stars. Availability: To Catch a Thief is available for streaming on Netflix Instant. It is also available on DVD, Blu-ray, and video on demand. Next week, I'll continue the theme of felines in film with Jacques Tourneur's horror classic, Cat People (1942).